GatorCountry brings you a new podcast as we preview the Florida Gators basketball week as the Gators face Arkansas and Kentucky this week. Andrew Spivey and Nick de la Torre are joined by Eric Fawcett who recaps the Gators two game stretch against the Mississippi teams before previewing this week’s games. 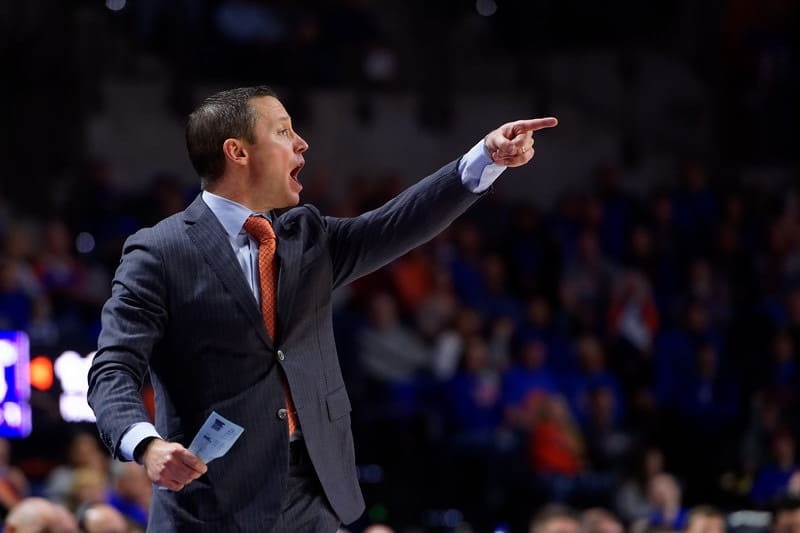 Andrew and Nick also Eric about why the Gators are struggling down the stretch in games and what they can do to fix that, plus why Kevaughn Allen is struggling. Andrew: What’s up, guys? Your man, Andrew Spivey, here with Nicholas de la Torre, and our man, Eric, as we bring our second basketball podcast up for you. Eric, no bold predictions this week, man. You said it was going to be an easy week. Eric: I must have jinxed us. I think it kicked in around the seven-minute mark in the left in the second half against Ole Miss, when we could only get one more field goal in the entire last seven minutes. I think that’s where my jinx fully kicked in. So, I better stay away from that this week. Eric: I think my superstition comes from when sometimes there’s a game or something you can’t watch of one of your sports teams you like, and then either the team does really well when you can’t watch their games, or they do really badly when you can’t watch games. Suddenly you start like, “Maybe I can’t watch this game,” or “I need to watch that game.” I watch all the Florida basketball ones, so I can’t use that excuse. Eric: Thanks for doing that for the whole team, Andrew. We’re glad you show self-restraint in those situations. Eric: Definitely. When you see the strength of that backcourt, you just know they’re going to win games. That’s what happens in college basketball. The team with the best backcourt usually wins games. Then, especially when you see that they actually also have some really good big guys inside. Hymon really cooked us at times, and they’ve got a couple of those international guys that didn’t really well inside, and they’re tough. They’re going to be able to grind some teams down. You mentioned how many games they lost, but it’s crazy. They’ve lost three games in overtime this year. They’re 0-3 in overtime, and all those games were at home, and those overtime games, they’re sometimes a bit of a coinflip. If some of those go their way, their record looks a lot better, and they maybe look a little bit more like the team they truly are. I agree with you. I think they’ll be looking a lot better than the 9-7 team that Florida played. It’s not going to be a horrible loss, particularly on the road. Ole Miss has one of the best home courts in the League, in the SEC, and actually, nationally one of the best home courts. To loss a game like that on the road, in the SEC, that is incredible. SEC this season, that’s just going to happen. Andrew: What do you make of that game? Listen, first of all, the officiating was atrocious. Jalen Hudson is six feet in bounds, not literally. Literally, he was a foot inside of the inbounds line, and they call him out of bounds. Then they have the charging call that they have to reverse. That’s just to name a few. Overall, the officiating was terrible. I guess, what do you look at that game and say the keys were for losing that game? Eric: I eluded to it before, but the biggest thing that lost the Gators the game was the fact that in the last seven minutes they were only able to make one field goal. That is a horrible number. It’s scary, because that’s something we’ve seen in the past. They’ve let some of their leads slip. They haven’t been able to close. I think a lot of the Clemson game, where they weren’t able to close. That’s been a lot of the discussion on the forums on Gator Country, about why can’t Florida score down the stretch? Why do they slow down the ball so much? That’s been going on all season, that kind of discussion. Then it just really came to a head when, again, seven minutes, and they can only muster one field goal. They got to the line a good amount, especially Keith Stone, who got to the line a ton. But you’re going to drop a lot of close games when you can’t score in the clutch. Florida’s not comfortable offensively when the game starts to slow down. They need to find an identity in those last minutes, when things start to slow down, and figure out, is Jalen Hudson your guy? If he’s your guy, how are we going to use him? KeVaughn Allen, who’s been throwing up a few consecutive bad games, what are you going to do with him? Who do you want on the floor, personnel wise? That was the biggest thing to me, to have that huge drought right at the end, and even the fact that they were able to keep it close, despite really not being able to score is incredible. They need to figure that out quick. Nick: How much of that do you think is natural, or how much of that is just a natural pace of the game, it gets late? How much of that is just scouting and teams seeing that if we can get Florida into the half court consistently, they’re going to have trouble? How much of that is teams forcing them into that, based on scouting? Eric: That’s a great point. I think that Florida, the fact that they lean so heavily on a few backcourt players, I think that really makes the scout a lot easier. They’re not concerned as much about what Florida’s going to do inside, even though, luckily, now Keith Stone has really been turning it on. He’s going to get some attention in the scout. They know it’s going to be high ball, screen for it for Chris Chiozza, and Ole Miss guarded ball screens really well all night. Or it’s going to be a Jalen Hudson isolation on the wing, and when a guy like Jalen Hudson isolates on the wing, you put your best defender on him. It’s hard to double a guy on the wing, so you put your best defender on him, and then you just see what happens. You see how the ball bounces. Hudson wasn’t able to hit some of the insane shots that he did in some past games, and they guarded Chris Chiozza high ball screens. Suddenly, things were not looking so good for Florida’s offense. I think that they were definitely comfortable in their scouts. That’s a great point, Nick. Andrew: How much does that change when a guy like Egbunu comes back? Eric: He’s not a guy you’re going to go to in the last couple minutes, so I don’t think he really affects things there. The one thing that would be really nice to have Egbunu in those final moments is just maybe his ability to get an offensive rebound up. When you have the ball with 20 seconds left, you can put up a shot with five or six seconds left, knowing you have a guy like John Egbunu, who’s there to clean things up if you miss. Florida needs a bucket in the clutch. They’re not going to John Egbunu in the post, but he’s a load. We know that. When he goes and sets a big on ball screen, he’s going to wipe out some defenders. Maybe he creates a little more space for Chris Chiozza. Maybe he sets a big old pin down screen for Jalen Hudson. It might be some improvement, but I wouldn’t say that’s an area he’s really going to affect. Andrew: Then let me turn it around and ask you this. If you were Mike White, what are you doing in these situations? It kind of is a situation where this was a problem under Billy Donovan a little bit, where you would run the clock down to two or three seconds, and Irving Walker was just throwing up a three-pointer from half court sometimes. It seems like some coaches have that It factor at the end of the game for calling that. What would you do here? Eric: You see that issue. Like you said, Billy Donovan had it a little bit. You see it with a lot of teams that like to play fast, because when the game naturally slows teams are just not comfortable running their 10 second or less offense when it’s 40 seconds left in a one-point game. I’m looking at things kind of get a lot of guy’s feet moving. I would love to see maybe three players at the top doing a bit of, you hear it called a three-man weave, where the player with the ball right at the point has two wings running towards him, and he can run a dribble handoff with either of them. Just to get three guys in motion would really make the defense move their feet. What happens right now is Chris Chiozza dribbles at the top, and then he gets a high ball screen, and that puts two defenders and two offensive players in action. That means three defensive players are getting their heels dug in, ready to help, ready to slide into the paint, denying passes. If you were to just get three guys involved at the top, that would really make a lot more shifting of the defense, and it would open up a lot more things. Maybe a double ball screen, where two guys set a screen on opposite sides of the same player, so that Chris Chiozza can make a read off either side. Just more movement, more guys getting into the action. I know that they would be really reluctant to do anything that is too much swing of the ball or passing action, just because you don’t want to turn the ball over there. Just something that’s Chris Chiozza running off multiple screens, or running dribble handoffs with multiple players. Just to really get things moving a little more, getting defenses to shift. Andrew: Are we obviously still saying Chris Chiozza is the guy that should be taking that shot? Is it a guy like a Jalen Hudson that should be taking the shot? I mean, me personally, when KeVaughn Allen is KeVaughn Allen, I like KeVaughn Allen having the ball. You and I both know KeVaughn Allen is not KeVaughn Allen right now. Eric: We’ll get to the KeVaughn Allen thing in a moment. I think Jalen Hudson is your guy to get that final shot off. Chris Chiozza has been clutch. We know that, but his clutchness hasn’t come from his jump shooting ability, and lots of times when you need a bucket late, it’s going to be a jump shot. Chris Chiozza, his great plays have been, obviously, that heave against Wisconsin, which was an incredible kind of wild play, and then he generated a bucket by getting a steal. He’s not the kind of guy that looks down his man, dribbles him down, pulls up, and drains an 18-footer. That’s Jalen Hudson’s game. He’s long enough to get a shot off against any defender that another team might put on him. He’s got a little bit of shake with his dribble, where you can get a guy going the wrong way. I think Jalen Hudson’s still your clutch time guy. I think Chris Chiozza is, obviously, your initiator. He’s got such good decision making and is such a good passer. I think he starts thing, but Jalen Hudson has got to be your trigger man, if the opportunity arises. Like you mentioned, KeVaughn Allen has been really struggling. I think he’s put up five points in the last one, and then three points against Mississippi State, and two points against Missouri. Seven points against Texas A&M, if you want to go four games back. I think you’ve even got to consider just maybe putting someone else on the floor right now in those clutch situations. Instead of just going really small with Chris Chiozza, KeVaughn Allen, Jalen Hudson, Koulechov, and Stone, maybe you take KeVaughn Allen out of there and go a little bit bigger with Kevarrius Hayes back in there, in case you need an offensive rebound. KeVaughn Allen just doesn’t have it right now. Andrew: What is it? Is it mental? Is it just mental? What is it? In the past, KeVaughn Allen has had a little bit of, I don’t want to say nervousness, but when he misses a shot, he doesn’t want to shoot the next shot. Is that still where it is? What is it? What is it, in your opinion? Eric: You mentioned it, the fact that he in the past has shown a little bit of wavering confidence when he’s missed a shot, but he’s never missed as many shots as he has now in this season. That could be tearing him up even more. Nick was talking about the scout earlier, and I think that KeVaughn Allen is a really easy scout for a lot of teams, because his game is actually fairly one dimensional. As much as I love KeVaughn Allen, the reality is he’s a guy who is a bit of a shooter who’s never really shot the ball at an exceptional level. As a freshman, he was close to the 30% mark, but he’s a freshman. Last season he was at 37%, which is a good number, but it’s not a lights out number. He doesn’t really have a lot of ball handling abilities. He’s kind of just a straight line driver that if he sees a lane he’s going to attack it, and he’s fast and strong, and maybe can finish with a dunk. If he reaches resistance, he’s not a guy who can do a quick crossover and get to his left hand and lay it in through contact. When your game is limited to shooting the ball and attacking a closeout in a straight line, if your shot is not falling, like it’s not for him, that just really limits your offensive game, and that’s what we’re seeing. We saw one of his buckets the other day against Ole Miss when he attacked a closeout and had a nice little one foot runner. He doesn’t always have a lot of those kind of creative mid-range finishes, and that’s what’s limited him offensively. If he can do more of those kind of runners and floaters, and just things to make his offensive game a little more variable, that would help him out a lot, especially times like this, when his shot isn’t falling. Nick: Maybe I’m not the only person, but I’m still here thinking he could do that. To me, it just comes down to maybe that killer instinct, that mentality of going and getting it. I think Mike White has said it before, he’s too selfless for his own good. He’s too good of a teammate, and he’s not going to take those chances and get into that kind of rhythm. Am I foolish to still be holding on to KeVaughn Allen could be that player, or is that just not him? Eric: When you see the way he’s built, just physically, and you see the skills that he has, there’s definitely something there that could be tapped into. No. It’s definitely not wrong to think that he still could elevate to be. He was on watch list for Player of the Year this season. A lot of people thought. It shows a little bit, like you said, just what it’s like to not have that kind of mentality where he’s going to go out and shoot the ball 20 times, because he is such a good teammate. He wants to pass the ball to other guys who can maybe shoot the ball a little better right now. I think sometimes he’s got to be selfish. He’s got to go up there and take a half decent look, just to get his feet under him, and, in transition, go and try to dunk on someone. You just want to see a little more fire from the guy. Maybe be willing to see a mistake from him, if it’s a mistake that’s done because he’s being confident and assertive, because being passive in the SEC is just not going to get you very far playing against such athletic, such talented wing. To play passive against some of the guys that KeVaughn Allen has to go against just isn’t going to fly. I would love to see him just kind of unleash a new level of confidence. Maybe make a few mistakes, but just know that I don’t think Mike White is going to be upset with him if he tries to play a little more with that killer instinct. Andrew: Listen, I don’t know if it’s still the case, and I’ll be the first to admit that, but at times last year Mike White was very vocal in saying, “Listen, we want him to miss shots. Miss your shots. Whatever it takes to get him going, do it.” I think that’s a thing that Mike White’s cool with. Being a shooter, he understands they’re going to miss shots. I don’t want to say Florida goes as KeVaughn Allen does, but I think Florida is a different team when KeVaughn Allen is that elite scorer, like he can be. Eric: Absolutely. You mentioned it. So many teams have one really good perimeter defender, but they don’t often have two really good perimeter defenders. Right now, teams have to say if they want their best perimeter defender on Jalen Hudson or KeVaughn Allen. Right now, it’s a pretty easy decision to put them on Jalen Hudson. Not only does that make things tougher for Jalen Hudson, but it also means that if KeVaughn Allen isn’t even scoring on a secondary defender then you’re not punishing a team for making those kinds of decisions. If you have both of those guys firing, then you have to make them choose, who do we want to guard, and who do we want to allow to work on a secondary defender? That would just open up all kinds of things like that, and, obviously, just shooting wise. KeVaughn Allen is a smart enough player that he gets himself in good situations. His shots, they just haven’t fallen yet. When those times come for him to nail a big three, if those go in, Florida is a different team. Absolutely. Like you said too, I think Mike White is totally cool with players missing shots and maybe having a turnover now and then, if it’s attacking in transition. As a former player himself, as a guy who also wants to preach going fast, he understands what kind of comes with that. If KeVaughn Allen wants to go up and miss a couple good shots, that’s going to be cool with Coach White. Andrew: Let’s go ahead and start taking a look here at the coming week. Florida plays a pretty good Arkansas team at home on Wednesday, and they follow that up with a trip to Lexington on ESPN on Saturday night. 50/50 this week? Win one, lose one? Is that what they have to do? They can’t go 0-2, of course. Eric: You never want to go 0-2. They’ve done a lot of good work to be where they are right now in the SEC. Against Arkansas, Arkansas looks a lot like Ole Miss, which scares me a little bit, in the way that they are just very backcourt heavy, very skilled guards. They have one really good freshman big in Daniel Gafford, who could hurt Florida inside. They have guys like Jaylen Barford and Daryl Maccon, who are senior guards that are quick, that work out if they can roll, which is eerily similar to what Ole Miss did against Florida. It’s a concern for me, for sure. With Kentucky looming, hopefully they’re not thinking too much past this Arkansas game, because they have to treat this one as a big win at home they need to get. Especially with College GameDay in Lexington, that’s going to be one that everyone has circled, especially fans as well. 1-1 would be great. I think Florida has a pretty good matchup with Kentucky, just kind of skill wise. That would be a great one to steal in Lexington on national television. It’s going to be a really good week for Florida basketball. These are going to be two really solid games. Andrew: Why is Kentucky struggling this year? Eric: We all know Coach Calipari after losses love to talk about how young his teams are, but this time it’s truly the youngest team he’s ever had. They don’t have enough ball handlers, I would say, if I had to really just boil it down. They have a lot of good frontcourt pieces. They have a lot of really athletic wings, but they don’t have as many ball handlers. They have Quade Green, who can kind of create his own shot, and then they have former Gator commit, Gilgeous-Alexander, who’s honestly been their best player, which really pains me to say. Like really pains me to say. Andrew: There was some money being dropped. Let’s just be cool about it. Eric: Yeah. They don’t have a lot of initiators on offense, so they’re going to just try to run in transition. Hamidou Diallo is a blur in transition, who can really score, but once things slow down in the half court, he’s not as much of a threat. They’re still kind of finding their way, but they’re just going to get scarier as the season goes on and they get to gel more. Not that it’s early in the season of college basketball on the whole, but still, relative to the SEC, this is an earlier game with Kentucky that if Florida can kind of jump on them, get them on the road, that would be huge for both SEC standings and national perception as well, as Florida tries to crawl back into the top 25. Andrew: Keys to that game? Eric: Keys to that game are definitely going to be to try to keep them off the offensive glass. That’s Kentucky’s best offense is chucking up a bad shot. They are a really poor shooting team, but they’ve got athletes like PJ Washington and Kevin Knox that just really hammer guys on the glass. We have to keep control of the boards, no question, and try to limit them in transition. I know Florida wants to play in transition too, so maybe that’s a part of the matchup we like. Guys like Quade Green and Hamidou Diallo, if they can’t play in transition, their effectiveness drops like a stone. Try to keep them from getting those boards and getting leak outs, that’ll be huge. Andrew: Can Florida play a half court game, in your opinion? Eric: They’re defending in the half court really well, so that’s a big improvement from the start of this season. Eric: Can they score? They’re still trying to figure that out. That’s my answer. Keith Stone has been a big help there, as a guy who can operate kind of in the high post. He can pass the ball really well. He’s really helped. Until KeVaughn Allen gives some consistency, Egor Koulechov, he’s not always been a very consistent scorer. He loves to shoot a lot of tough shots in the mid-range. I think those need to go away. Florida’s not an awful team in the half court, but I think you need to be a really good team in the half court, if you’re going to be at the top of the SEC, and hopefully going deep in the NCAA tournament. Nick: Question about Stone. Obviously, coming off a career high 23 versus Ole Miss. He’s averaging 16 in the last four games. Which Keith Stone is the more real version, the one we’ve seen these last four games, or the one in the beginning of the season, the one where I see on Twitter people are saying, “No one in the history of Florida basketball has worse hands catching a ball than Keith Stone”? Which is the more real Keith Stone, the one we’ve seen the past four games, or the one that gets torn apart on social media? Andrew: Let me say something before Eric says something. Eric, you can disagree here with me if you want. Andrew: Does he not have the prettiest shot leaving his hands that you’ve seen in a long time? Eric: He has a gorgeous shot. I love to watch it. I would like to take his jump shot out for a fine seafood dinner. It is just so gorgeous. Nick: And you would call it back again. Eric: Of course. Absolutely. I mean, asking about which is the real Keith Stone, it’s definitely closer to what we’ve seen recently. I would just go back to even when Keith Stone was a redshirt freshman. I remember Mike White and the staff saying he was playing so well in practice. If you remember back to three seasons ago, when Florida was struggling in the SEC, for sure, they were considering burning his redshirt and trying to just get him to play halfway through, because they needed him and thought he could contribute offensively. Then we didn’t really see it last year. He never really found his offensive rhythm. He didn’t have it to start the season, but he finally has it now. For the coaches to be gushing about him during his redshirt year, and for him to really not find that his entire redshirt freshman season, to see it finally now, I do think it’s for real. Like you said, about his jump shot, that is a pure stroke, and a stroke that pure is not going to be a hot or cold stroke. That’s a consistent stroke, which means I think he’s going to be a consistent shooter. Now he has the confidence to take bigger guys off the dribble. That was always going to be the thing with Stone was can he take advantage of bigger players with his speed and skill. We never really saw that, and when he wasn’t taking advantage of bigger players with his speed and skill, he was just kind of an undersized big that didn’t rebound very well, or didn’t score very well. Now that we’re seeing him, he’s blocking shots, which I think is a big influence. Playing next to Kevarrius Hayes, who’s been just an excellent shot blocker, and Keith Stone is picking that up. To see Keith Stone taking guys off the dribble. You’ve got to have confidence to go to the line 18 times, like he did against Ole Miss, because you’ve got to be making confident plays that force you to get fouled, and that’s what happened. I would say Keith Stone is not going to be a 20 point a game guy, but I think he’s a lot closer to that than he is the guy getting roasted on Gator’s Twitter. Nick: You think maybe we’re just seeing a maturation of Keith Stone, and maybe that confidence building up now? Eric: Yeah. He’s just so much more of a confident player than we’ve seen. Offense is so much confidence. If you look at the best offensive players in college basketball, you’ll also probably be looking at a list of the most confident players in college basketball. There’s no players that are in the top 50 or top 100 or top 200 offensive players that you look at them and say, “They’ve got some wavering confidence.” Scorers have that killer instinct. They play confident. Keith Stone has it. Eric: Yes. No conscience. Jalen Hudson is the king of that, for sure. At least Keith Stone might have that influence on the bench with him. Andrew: Unless you’re KeVaughn Allen. Eric: He hasn’t quite picked up on it like Keith Stone has. Shooting is contagious, so maybe KeVaughn Allen seeing so many other guys hitting shots will give him the confidence to go up and drill one himself. Andrew: I was going to ask you about that. When you look at a guy like Keith Stone, that has to feed over to other guys. When you look at what he’s been able to accomplish just this year, that has to feed over to the other freshmen, to the other guys. Look how far he’s come. I do. Personally, I think that going into the season, had you said what you were going to get out of Keith Stone is now, Mike White would have been happy. Eric: I’m sure that Mike White has been super happy. I think that’s a really great point, Andrew, about other players seeing the process Keith Stone has gone through. I think that must be especially huge right now for a player like Chase Johnson, who played minutes early in the season and very much thought that he was going to factor into the rotation, before a bunch of wild illnesses and injuries and concussions have just left him off the floor. I think for him that must be pretty discouraging, because he thought he was going to be able to really play a consistent role. Maybe he’s even going to take a redshirt year this season. For him to see a player like Keith Stone, who actually has a pretty similar skillset to Chase Johnson, for Johnson to see Keith Stone going through the process. Obviously, he wasn’t there during the redshirt or his redshirt freshman season, but for Keith Stone to say, “Hey, man, I had to redshirt my first year. I struggled with this, this, and this, but I came out the other side.” I think that’s got to be really great for Chase Johnson at the same position, and even just for other players, like KeVaughn Allen struggled with his confidence, and he saw Keith Stone get his confidence back. That’s got to be encouraging. Andrew: Last thing I got for you, before we get you out of here. We all saw that John Egbunu was practicing, no contact and no competitive drills, on Monday. What are you hearing? Is it more February now, or is a couple weeks? What are you hearing? Eric: Mid-February is kind of the thing I’m hearing for a goal. It’s so crazy. You look at the SEC schedule, and because there’s no easy games, it’s not easy to be like, “We’ll get him in against this cupcake team for some minutes before we get into some more important games.” Because every game is important, and every game is against a tough opponent. I would say you look at on February 10 there’s South Carolina. They play on Valentines Day, I think, against Georgia. Vanderbilt after that. I’m looking at those dates just as, I guess, somewhat arbitrarily, because they’re playing this so close to the vest. If they can get him in one of those middle of February games, and he could have six, seven, or eight, nine, games before the SEC tournament. That would be some good experience, some good time to get his legs back under him and hopefully be as close to 100% as he could be for the SEC tournament, and then beyond. They’re playing it tight to the vest, which I understand, because as soon as you give deadline dates, then it just sets you up for people to be mad if they’re not hit. For John Egbunu, it’s probably too encouraging if you set deadlines and he doesn’t meet them. That’s got to be discouraging for him too. I don’t know for sure, but those middle of February dates are the ones I’m kind of looking at. Andrew: Sounds good. Nick, tell everybody where they can find us. We’ll get out. We’ll see everyone next Wednesday. Nick and I will be back on Friday for our podcast, and then back next Wednesday with Eric again for more basketball. Nick: www.GatorCountry.com for all your Florida Gator news. The podcast is there in audio and transcript form. You can find us on social media, @GatorCountry on Facebook and Twitter, @TheGatorCountry on Instagram. You can find Eric, @EFawcett7 on Twitter. I’m @NickdelaTorreGC, and he’s @AndrewSpiveyGC. Andrew: There you go. Guys, we appreciate it so much, and we’ll be back again. As always, guys, go Braves. Chomp, chomp.